A few weeks ago I spotted the first of the goldenrod blooming in the field behind my house, which meant all of my other projects and activities came to an abrupt halt while my life turned into a sticky, honey-covered disaster. 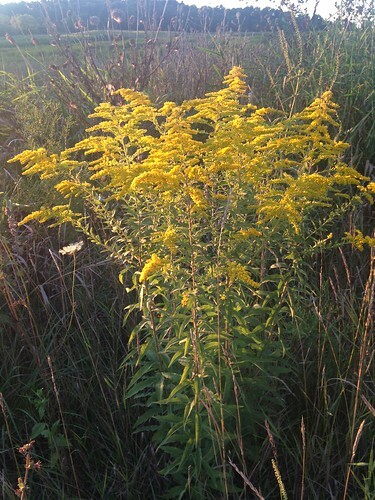 Because goldenrod– whenever it makes its appearance– means that honey harvest needs to start in very short order. The thing about that beautiful yellow plant is that bees love it, which is awesome for them, but it also has the peculiar characteristic of making honey smell like, ah, feet. Which is not so awesome for those of us who want to enjoy honey without being reminded of a gym locker. 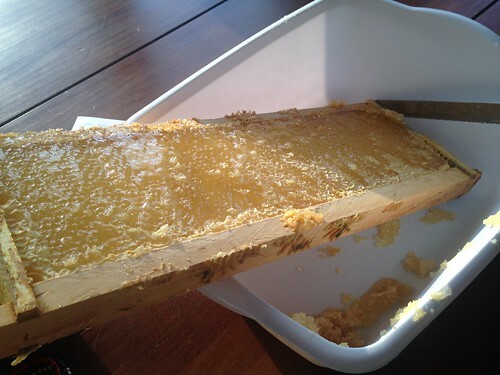 Last year I harvested a bit after the goldenrod came out, and my honey actually had a pleasant tang, and not too much funk, but I didn’t want to take any chances this year, so at the first opportunity I harvested 2 medium supers and 1 shallow box of cut-comb honey from my 2-year hive. The Sunday I started pulling boxes off the hive was intensely hot and muggy, and toward the end of a couple of very sweaty hours the combination of a soaked bee suit and lifting a 40 lb box of honey into my honey-harvest-mobile (aka golf cart) the bee suit was pulled tight enough against my shoulder than one of the bees actually stung me through the fabric. That’s the price you pay for what turned out to be 80 lbs of jarred honey and 60 pieces of cut-comb. However, the icing on the cake was that as soon as I was done removing boxes from the hive and jumped in the golf cart to drive back to the house, the battery died. 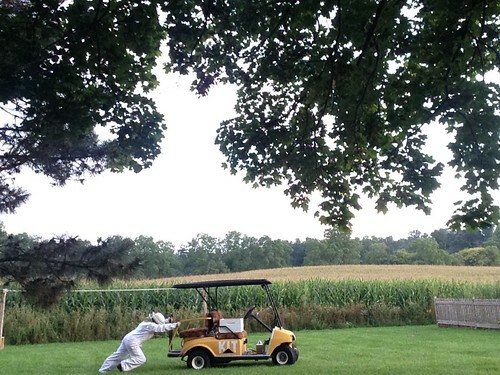 I very often push a heavy sled as a part of my workouts during the week, and I also very often grumble at that activity, however after pushing a golf cart up a hill while wearing a bee suit and being pursued by some less-than-amused bees, I won’t be complaining about that particular workout again. In fact, I may need to keep upping my weight on the sled… golf carts aren’t light. As for the honey, the process of extracting and packaging honey was significantly easier this year because I actually know what I’m doing. 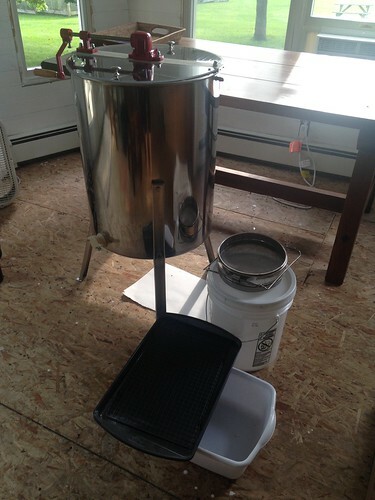 I sprung for a stainless-steel 4-frame extractor this year, which is light years beyond the plastic bucket I used last year. 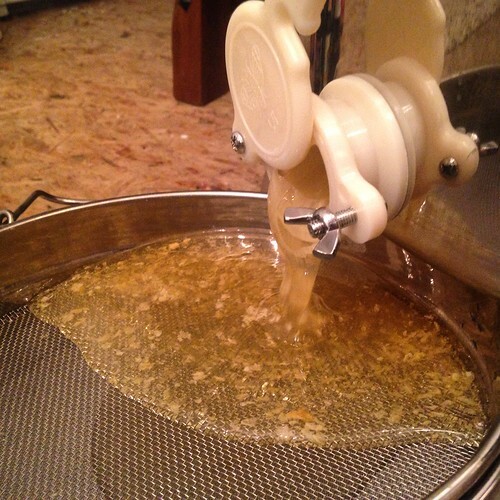 This whole process takes a few days, and from about 5 minutes in I end up with honey everywhere. Floor, tables, sink, clothes, electronics, eyebrows… seriously. It’s just not a job that can be done without a little stickiness. And cut to be served comb-and-all. I got 60 squares from one box, and my freezer is going to be full for the next year. I’ve considered getting a booth at the local farmers market to sell some of my honey this year, but time is scarce as usual, so it may just end up that I spend all of this time harvesting honey to give it away to friends and family like I did last year. And since being able to provide for people I love from tending the land is one of my very favorite things about having this farm, I’m actually totally okay with that too. 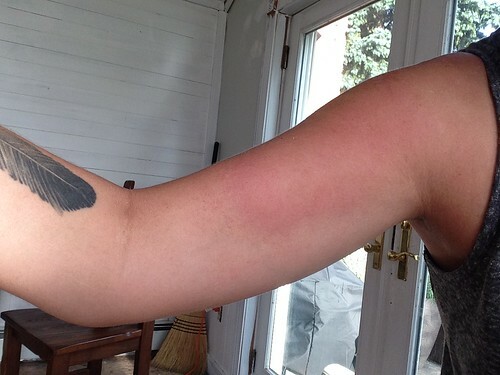 Um, I don’t remember you mentioning any bee allergies, but… my first sign of being allergic to bees was a sting swelling up really bad. I now go into anaphylactic shock. Maybe you should have an epi-pen around, just in case. I’ve gotten stung by a bee, and it never looked like that. The crooks selling Epi-Pens have come out with supposedly a renamed $300 version under a different name. 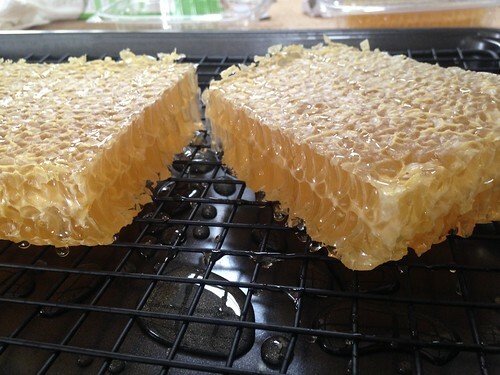 I looked honeycomb to see what one does with it, and all I found were recipes for making fake honeycomb. It’s best eaten on crackers with cheese (or on a piece of toast or warm biscuit.) Some people like to eat it straight and chew on the wax like gum. Hi Kit! 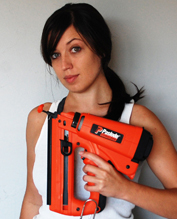 Do you have a link to the extractor you purchased? My FIL started keeping this year and we were discussing harvesting tonight at dinner. That may be something he’d be interested in. Thanks!! Two things really help soothe stings: frankincense oil and meat tenderizer. 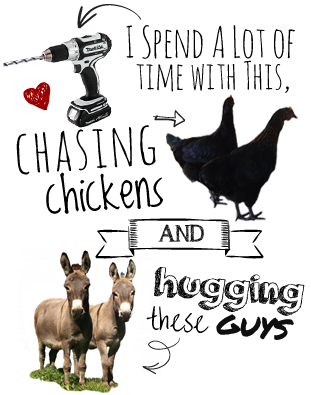 Your stories of farm life sound like a dream. I discovered the miracle of lavender oil this year. Works wonders for mosquito bites, fortunately I haven’t had the opportunity to use it on a bee sting yet. Might be worth a try. Thanks for the post. I am always happy to read of your doings/adventures/disasters etc on your farm. 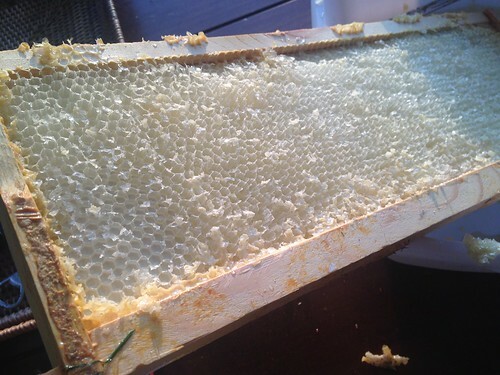 We harvest honey as well on a very small scale and I keep the frames separate as each one has such a distinctive flavour. 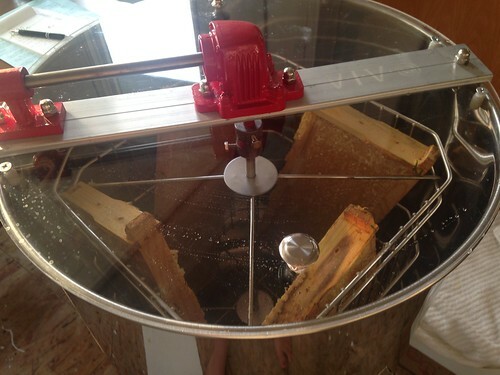 I know that will not be possible when we take more honey but for a new beekeeper it was an interesting side note. 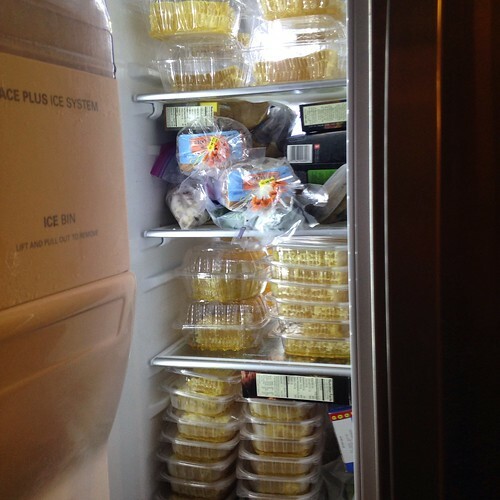 I did not know you could keep the cut comb honey in the freezer. Regards and keep enjoying each day. Presently cruising the canals of The Netherlands for three months on our boat. Glad you left some for the goldenrod ‘experiment’, look forward to hearing about the comparison. Epi pen might be worth looking into. Congratulations on the honey harvest. There is no un-sticky way to do it. Ah, the bee stings. I get pinged every once in a while, too. Sometimes they swell, sometimes not. It depends on the time of year [what pollen they’ve got on them] and the body part affected. Epi pens are running around $600 each these days, so skip the pen and keep a bottle of children’s benadryl around. You can drink it and it’ll work almost as fast as an epi for a tiny fraction of the cost. 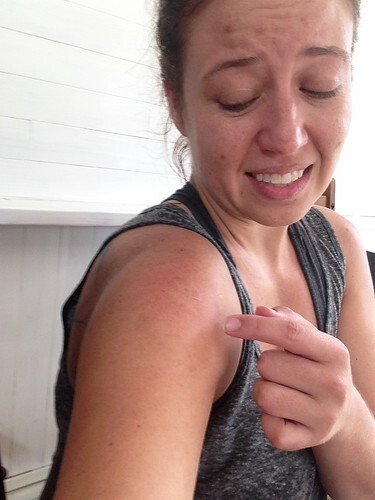 You can actually either build an immunity or build an allergy to insect stings/bites. If you keep seeing that much swelling when stung, please at least keep some liquid Benedryl around. This liquid will go into your system faster and it is give in the medical field to help slow down antiphylaxis. Could you maybe get another vendor to sell your honey at their booth and split the profit? Just a thought. Very classy extractor, enjoyed your information. I am trying to learn as much as I can about bees so that I can add them to my garden. Kit, I’m so happy to have accidentally clicked on a review of all your projects over these past years when intending to read about this, your latest, adventures in apiculture. It reminded me of how long I’ve been following you on your adventures. I want to express my gratitude for your willingness to share your life and knowledge with us. Enjoy the honey and mead. Thanks so much Melody! It’s only fun to share because people are willing to listen! Saw this just a little while ago. Just a thought. I use DAO histamine digester for allergies & bug bit’s – gets rid of the itch & pain in minutes. Long time reader here. Congrats for the bee-keeping results. It seemed to me that the beehive is placed directly on the dirt. It should be better at a distance from dirt, in order to keep mice and crawling insects from entering the hive. On another hand, you might want to look into horizontal beehives, easier to access than vertical ones. 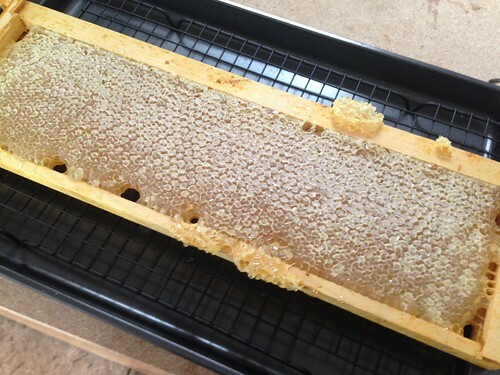 Impurities from honey can also be separated by slighty heating it in Bain-Marie and, finally,honeycombs don’t need to be kept in a freezer or even fridge, but in a cool pantry. Thanks adel! 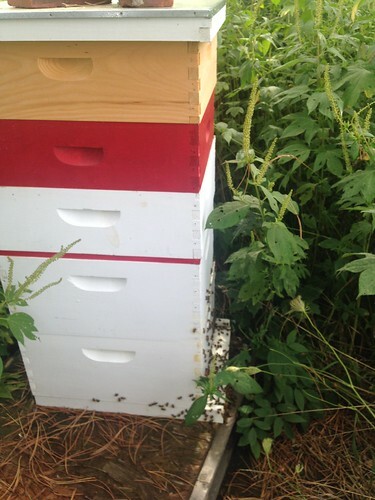 All my hives are actually set up on pallets with a plywood top, so they’re about 6″ off the ground. Not sure if that helps with the mice, but it helps keep things orderly around the hive. I’m thinking of building some taller stands for them since I’ve decided to stop at 4 hives in that small wooded area. We had bees many years ago and I was too intimidated by them to fully appreciate them. This post makes me want to become a bee-keeper in my old age. I had an adopted gramma many years ago who used bees to treat her arthritis (recommended by a medical doctor at the time!). She would sit outside the hive and wait for a bee to land on her, slap it so it would sting her and, thus, receive whatever it was that greatly reduced the pain of her arthritis. I believe she did this twice a week. Her husband told her she could only slap a bee on its way out of the hive. One coming IN would have its little pollen sacks filled and (heaven forbid) she should kill THAT bee!). Honey!!! The only natural food which never expired the date. 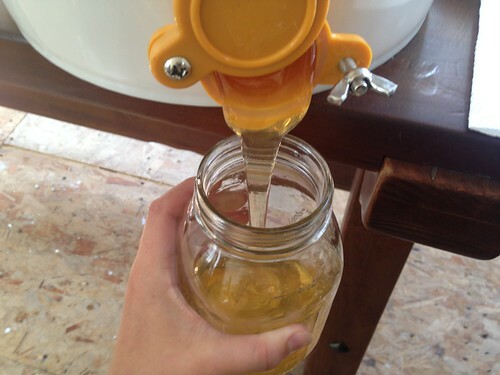 It was really a cool post about honey. I learnt a lot from here. Thanks Kit for this nice stuff!